Representative Honours: Ireland: 1 Victory Cap (1946). Club Honours: (with Bohemians) FAI Cup Runner-Up 1944/45; Inter City Cup Winner 1944/45; (with Glentoran) Irish Cup Runner-Up 1946/47. In the immediate post-war period the Irish League suffered the loss of many of its biggest stars - those England and Scotland-based players who had "guested" during hostilities. 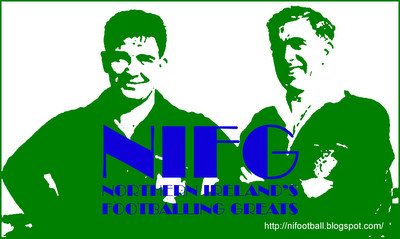 New experienced players were required and Glentoran, for one club, looked south. Among those arriving were Paddy Waters (from Bohemians), Noel Kelly (ex-Shamrock Rovers), Con Martin and Jimmy Lawlor (both Drumcondra). Paddy Waters played in Bohemians 1-0 FAI Cup Final defeat by Shamrock Rovers in April 1945. A few weeks later he was in the Bohs team that defeated Belfast Celtic 3-1 on aggregate in the Inter City Cup Final. 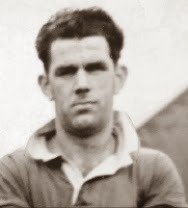 He arrived at the Oval in February 1946 and, although the Glens were struggling for form, he was selected for the May Victory International against Wales. Mainly a centre-half, he played in that match at left-half. An impressive second season with Glentoran saw the defense tighten up but they could only finish as runners-up in the League and Irish Cup. In June 1947 Waters transferred to Preston North End. He had to wait until the following February to make his debut, in a 1-1 draw with Manchester United. He was a fairly regular starter at centre-half through the following two campaigns but couldn't help Preston avoid relegation in 1949. He lost his place in spring 1950 and that October he joined Carlisle United. In eight seasons at Brunton Park, Waters appeared mainly at centre-half but could also be found regularly at left-half. The Cumbrian side however remained firmly a Division Three (North) side. Waters was noted as wearing soccers' shortest shorts! Paddy died 2nd March 2004.